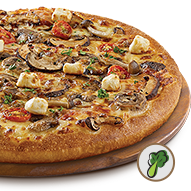 Be enthralled by a mouth-watering medley of fresh mushrooms topped with cherry tomatoes and cream cheese on creamy alfredo sauce. 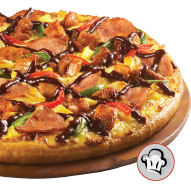 Spicy chicken chunks, chicken ham, luscious pineapple chunks with fresh capsicums, baked on a sweet and smoky BBQ sauce. 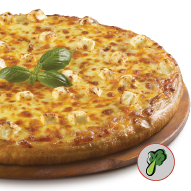 Send your tastebuds into a cheesy frenzy with a divine combination of 4 cheeses - mozzarella, parmesan, cheddar and cream cheese. 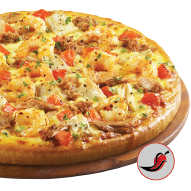 Taste the freshness of the ocean in this combination of juicy prawns marinated in spices, succulent squid and tasty tuna. 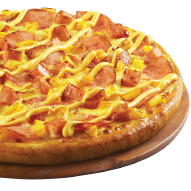 Chunky chicken ham, chicken ham slices and pineapples finished with a creamy cheese drizzle.